The anti-austerity protests have been turning progressively more violent this year. 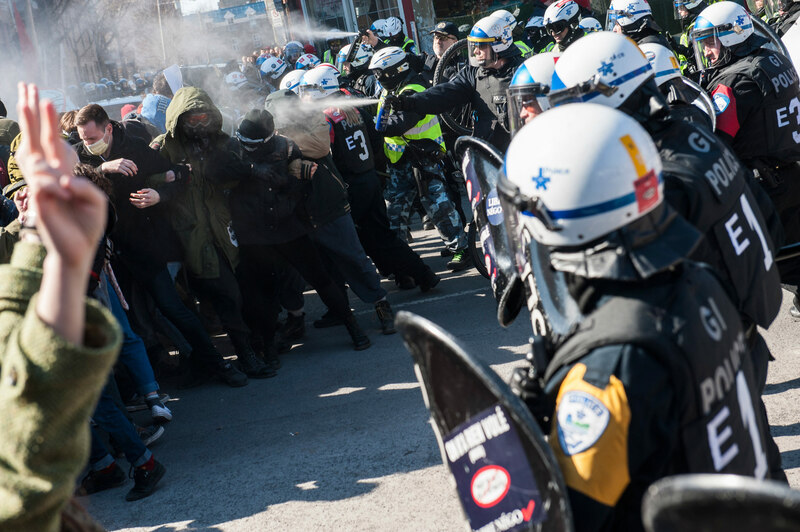 The biggest one of the year—with tens of thousands of protesters on the scene—ended in violence on Thursday afternoon after a long standoff with the SPVM on the corner of Beaudry Street and Maisonneuve Boulevard. The scuffle started once while protesters were marching in the opposite direction of traffic and were met with a row of raised bicycles on the street corner. SPVM ordered the students to head south on Beaudry St. and maintain the peace. The protesters chose to stand off with the police. Some 200 people opted to attempt a non-violent sit-down but were quickly deterred by their peers. Officers gave multiple warnings to protesters to head south, which the protesters met with jeers and yells to let the crowd pass. The tension was palpable, from all sides. It remains pretty unclear as to who reacted first but the crowd broke as the riot police intervened. Tear gas was fired multiple times down Beaudry St, filling it with smoke, but no stun grenades and flashbangs were deployed. There were not only students in the crowds, but also city employees—such as firefighters—and families. According to CJAD, some children as young as 12 years old were seen. They said on the radio a young girl who came to the protest with her father had been spotted after the fray of tear gas, “crying and clearly distraught.” The demonstrations continued throughout the streets for at least another hour, wherein police were trying to disperse all the various groups that had divided from the initial leviathan march. The Concordia University faculties on strike gathered at half past noon in front of the Hall Building. When most had gathered, they were encouraged to grab the free sandwiches offered by the People’s Potato. As the protesters headed over to the Square Victoria, McGill University’s protesters and a group of high school protesters all joined the ranks. By the time the group arrived to Square Victoria, the crowd was at least one thousand strong. An SPVM officer said they had expected about 400 people to show up from Concordia’s side and that he did not expect a group of two universities and high schoolers to show up. The crowd that filled all of Square Victoria was impressive. CJAD 800 reported throughout the day anywhere between 15,000 to 25,000 people were estimated to be present. The SPVM declined to give out their exact estimate. The march was preceded by several talks, including from the leaders of syndicates and the leader of ASSÉ, Camille Godbout. The protest started in peace and the police presence was not felt as predominantly at first without the usual officers skirting the sides of protesters. Despite that, a police chopper appeared overhead within minutes. Students walked up University St, heading for Sherbrooke Street. The march seemed very linear, as they walked down Sherbrooke all the way to St. Denis St, where they walked up to Cherrier St and under the Berri Overpass. Overall, the biggest demonstration that the city seen has successfully dwarfed it’s 2012 predecessor, not only by it’s sheer impressive size, but also by being one of the most violent ones this year. Tear gas and riot police notwithstanding, it ended with only two tickets, one for wearing a mask and the other for aggressive behaviour. No arrests were made.